I know it's a few days late but here's a Valentines day strip. 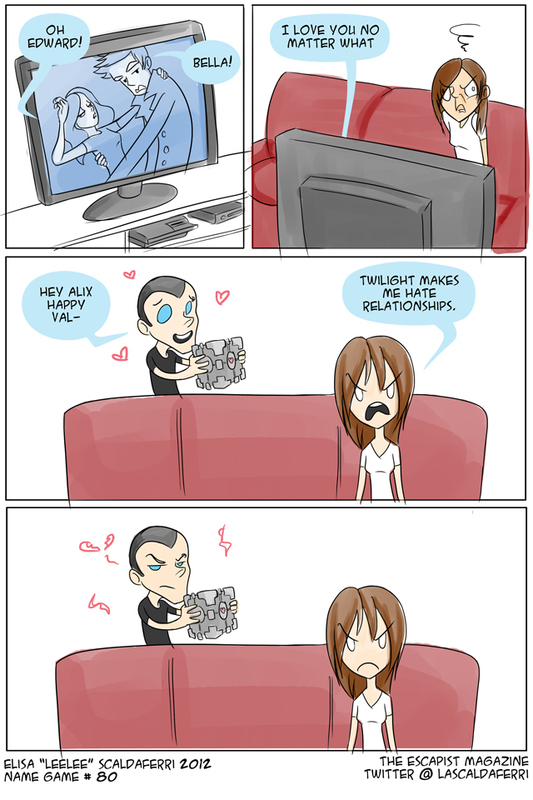 I recently watched the Twilight movies and was absolutely appalled by how awful they were ... I mean I knew they were bad ... but holy crap. At least I had the RiffTrax to make them a bit better. I'm going to start guest strips next week but I wanted to at least hold the reins for making fun of Jack once again on this special occasion. For those of you who have been messaging me about doing guest strips, I have a few artists lined up already so I'm not taking anymore for now. If the well runs dry, I'll have a contest or something. Some exciting news! I'll be doing video coverage of GDC that will be hosted here on The Escapist. What could be more exciting than that? I'll tell you what, my camera guy. Some of you may remember him from a little show that used to be on The Escapist. That's right, Michael Shanks will be joining me on this adventure. I also just found out I won a contest from G4 to do a Review on the Run with Scott Jones and Victor Lucas. I guess the world just wants me to play news reporter for a bit. I'm excited (and terrified) to see how it goes.